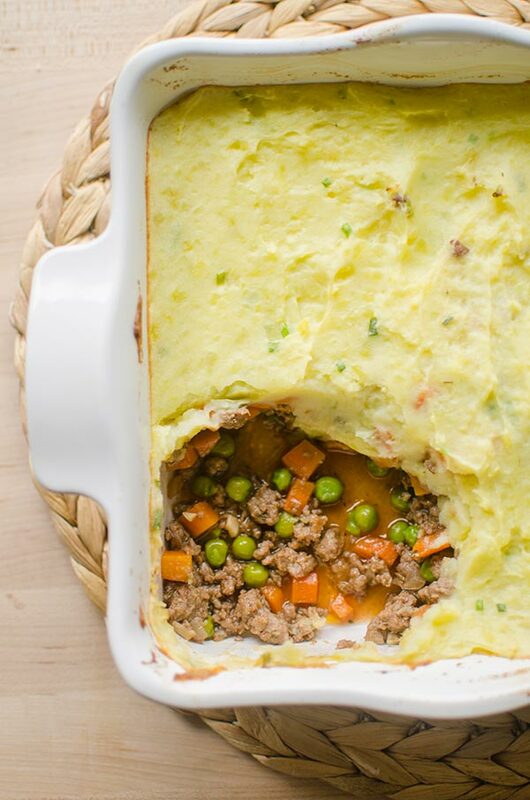 Lamb shepherd’s pie with peas and carrots and a chive mashed potato topping is the perfect recipe to make with spring lamb. 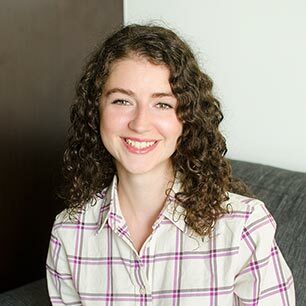 I’ve really grown to love lamb over the last couple of years. I love how much flavour it has. It’s, well, lamby. Depending on the cut of lamb, it can be more or less intimidating. Lamb shoulder chops are one of my go-to cuts for an easy, braised lamb ragu but for shepherd’s pie, you can’t go wrong with ground lamb. Ground lamb is more mellow and mild than other cuts of lamb–it’s also a lot easier to find and available at most grocery stores. Don’t worry, if you’re just dipping your toes into the lamb side of the protein world, this is a great introduction. Technically, it’s only a shepherd’s pie if it’s made with lamb–any other kind of meat (beef, chicken etc.) is considered to be “cottage pie”. Shepherd’s pie is a quintessential simple, homely and comforting recipe. It’s not really trendy. But I love it. It’s the perfect kind of recipe for this in-between season. That season between winter and spring when you’re not sure what to cook. Just me? Didn’t think so. If you are roasting a leg of lamb for Easter, you could replace the ground lamb in this recipe with leftover shredded roasted lamb, which is actually how this dish was traditionally made in Ireland (and how it started in the first place). You often hear about “spring lamb”, it essentially means that the lamb is younger and thus, more tender and has a little less of that famous lamby flavour. It’s available from February to June. The meat will be slightly pink (the meat becomes darker as it ages), but I wouldn’t be concerned about spring lamb when cooking with ground lamb. I top this shepherd’s pie with a chive mashed potatoes. You don’t really need the chives, but I like the fact that they add little flecks of colour in an otherwise kind of boring looking dish. They do add a hint of fresh and light onion flavour as well, which is welcome. If you wanted to, you could use your fork to make a nice design in the top. But honestly? That’s not really my style. That’s a little too retro for me. I wanted my recipe for lamb shepherd’s pie to be at least a little modern. 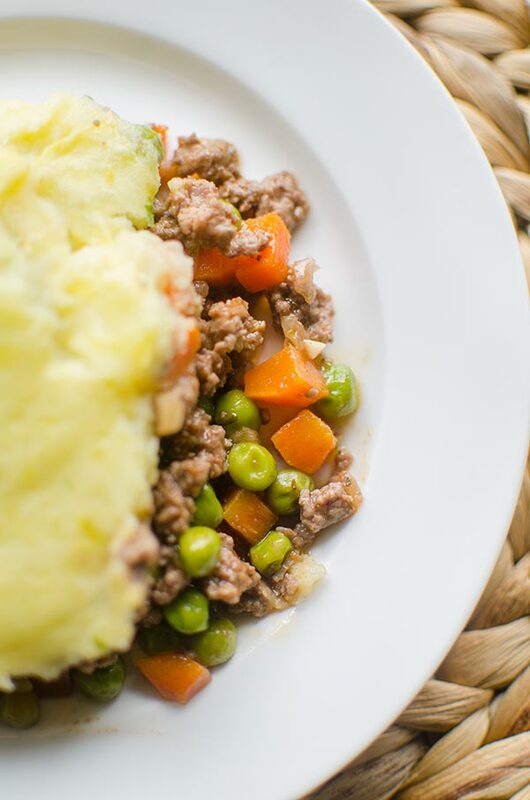 Lamb shepherd's pie with peas and carrots and a chive mashed potato topping is the perfect recipe to make with spring lamb. 2. Bring a large pot of water to a boil. Add 1/2 tsp salt and potatoes. Cook for 12-15 minutes until softened. Drain, and mash with milk, butter, 1/2 tsp salt and chives. Set aside. 3. Heat olive oil in a large pan over medium heat. Add onion and carrot, cook for 5-7 minutes. Add ground lamb, and 1/2 tsp salt cook and crumble for 5 minutes. Add garlic and tomato paste, cook another minute, until fragrant. Add red wine, and cook another minute. Stir in thyme and frozen peas. 4. Spoon lamb mixture into a an 8x8 or 9x9 square baking dish. Top with potatoes. 5. Bake in the oven for 15 minutes or until topping has started to brown around the edges. 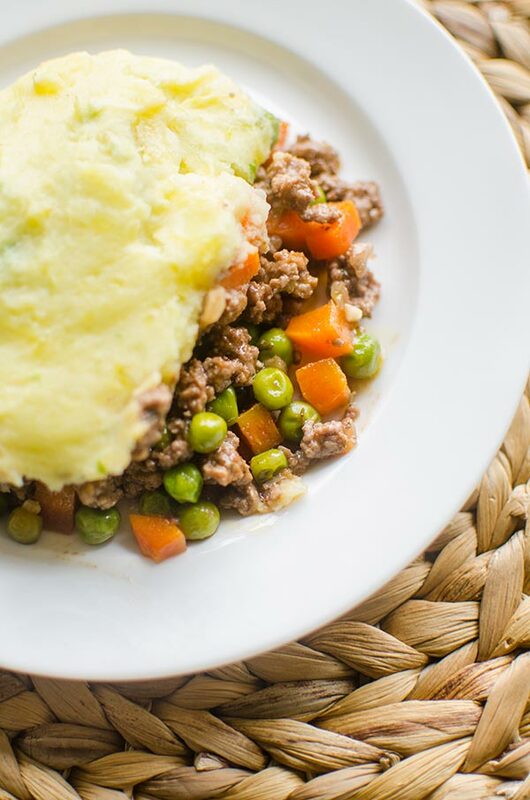 Let me know if you give this lamb shepherd’s pie a try in the comments below. « The easiest, homemade cupcakes in the world!